Note: I tried taking these photos with a DSLR, but it seems like the lens or body was defective. I've since exchanged the camera for a new one which seems to be functioning much better. In the people that I interact with daily, I've found that many do not know about truffles. 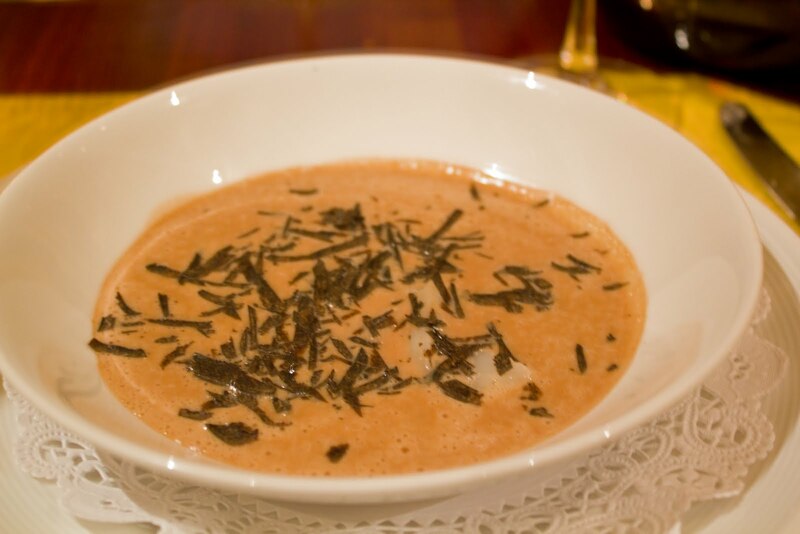 Many people think of truffle as the chocolate confection that they buy from Godiva, so when there is mention of a truffle risotto, they think of it as some sort of chocolate rice mixture that doesn't make sense. Interrupt: Truffles are in fact fungii that grow at the roots of trees. In order to find truffles, pigs are trained to smell them through the dirt so that they can be carefully harvested. Return: Along with foie gras, truffles are one of those "staple" fine dining ingredients that many people stereotype with a fine dining meal. While I acknowledge that there is some pretentiousness with these ingredients, they are like that X designation you get on your Intel CPU (Extreme Edition); you may pay more for these components, but they do enhance the overall experience at the end of the day. One simply needs to try the product at least once before they can make an informed decision. With that said, a proper introduction to truffle as an ingredient completely changes the culinary perspective. While dining is always a savory sensation and often a visual sensation, truffle often ups the ante by introducing the aromatic sensation. Similar to when consuming too much wasabi creates a tearing and spicy sensation in the sinus, a properly prepared truffle dish can provide the sinus with a soothing and comforting sensation. 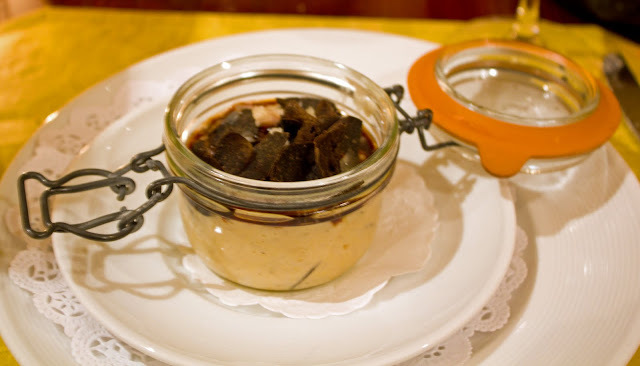 Getting a tip from a fellow blogger, I eagerly anticipated Cavaillon's truffle tasting menu. Cavaillon is run by Phillippe Verpiand who named the restaurant after the town where he grew up as a child. Verpiand worked in numerous Michelin starred restaurants before being asked to serve as Chef de Cuisine at Tapenade Restaruant in La Jolla. After working there for 7 years, Verpiand opened Cavaillon where he has been for the past 5 years. Verpiand's cuisine emphasizes fresh and local ingredients prepared with classic French and modern food preparation techniques. 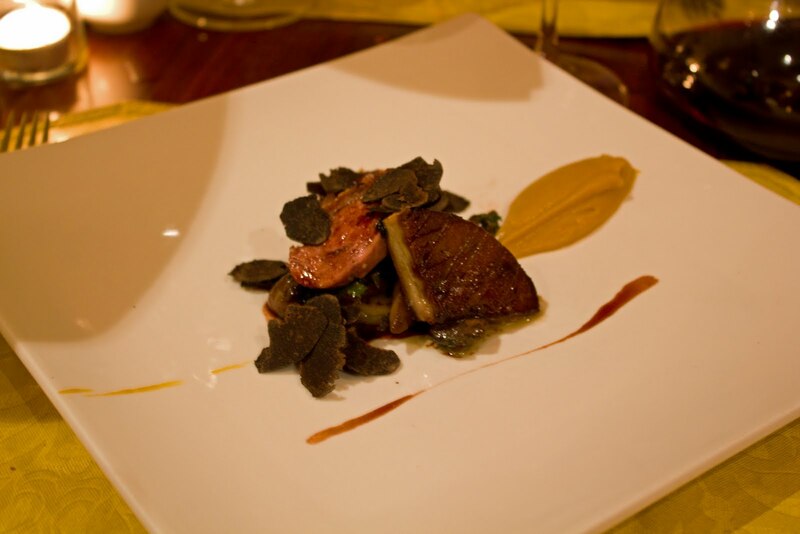 The black truffle tasting menu is a seasonal menu at Cavaillon. I believe that I caught the tail end of the winter truffle season and that the menu as of this writing is either no longer available or going to shortly be unavailable. With that said, there's nothing stopping Verpiand from having another seasonal truffle menu during the summer truffle season. To accompany the meal, we brought a bottle of 1999 Chateau Lamothe-Cissac Haut-Medoc. 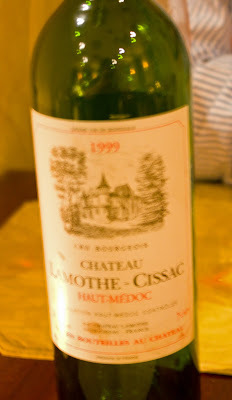 We vinturi and decanted this wine twice, and it still had not fully opened by the end of the 2 hour meal. The complexion of the wine constantly changed as time progressed. In the initial taste, there was the taste of raspberries. About 45 minutes later, the taste was mainly a moldy wood taste that lacked fruit completely. About an hour and fifteen minutes in, the wood taste finished with blackberries and the tartness of blueberry. Finally, about two hours in, the initial black raspberry flavor returned to the start and the tart dryness of the finish had left. To some extent, I wish that the service was not so rushed so this wine could have been enjoyed more or that it could have somehow been properly decanted, but it was definitely a good bottle. If someone has this in their cellar, now is definitely the time to drink it (after letting it decant for 2-3 hours). This course arrived about thirty seconds after the bread arrived and without an amuse. While an amuse is not required, the meal would have been paced better with some sort of amuse. In addition to the mini-french dinner rolls that arrived as the "bread course," this course was served with brioche. As I tasted this course, I tried it many different ways. I tried the two apart, together, each on the brioche, each together on the brioche. I really liked each component by itself, but in the end I don't understand how the date goes with or contrasts the foie gras. Furthermore, the brioche almost completely ruined the dish. The slices of brioche were too thick and covered up the flavors on the plate. Luckily the french rolls served as the bread course worked perfectly with both the foie gras and the mousseline. Another slight negative to this dish was the offensive salt crystals sprinkled on the torchon. If you look carefully on the right side of the torchon, you can actually see how large the salt crystals were. Despite these downsides, the torchon was of excellent quality and flavor. I don't think the truffle added much to the torchon as the flavor of the torchon itself was very enjoyable. As I mentioned before, part of the experience to truffle should be enjoying the aroma of the truffle as it develops a gracefully smooth harmony with your nose. By putting the risotto in a jar, the lid is supposed to capture the aromas and let out the great smell as the jar is popped open. The level of disappointment I had when the jar popped open and was the same as the devastating and earth-shattering doomsday of the Y2K problem. No huge overpowering aroma, and not even a small hint of the truffle aroma, there was simply nothing. Now, it's definitely possible that I may have had too many expectations going in, but when you see "Black Truffle Risotto" on the menu, you are conditioned to expect something and I definitely didn't get that. With that said, it was still a pretty good truffle oil risotto with black truffle shavings on top; it just wasn't a good black truffle risotto. The rice was cooked well and there was a good amount of cheese mixed in to give a nice consistency to the risotto. If I had to give some opinion as to why this dish suffered, I'd say it's because the truffle shavings were too thin. In general, I will have this same criticism in most of the dishes. I would have rather had fewer truffle and thicker cuts than the paper thing shavings that I got that had no flavor (or else the truffle used was just bad and lacked flavor). This dish was the best dish of the night. The chestnut and celery root veloute mixed with the truffle oil was divine. I was essentially licking the bowl for the veloute - the veloute provided the perfect vessel for the comforting taste and aroma of the truffle to be delivered that I didn't get from the opening of the risotto. This dish brought be back into a positive mood for the evening, and contained the "wow" factor I expect in truffle dishes. As for criticism, I felt that the scallop carpaccio was unnecessary. The truffle covered the delicate sweetness of the truffle, and the texture of the raw scallop was the slimy gelatinous texture that many people struggle with. If a protein were to substituted, I would suggest crevettes as there is a stronger flavor and more of a textural contrast. Additionally, when consuming the veloute, I got a feeling of sand in my teeth. I feel this was from the way the chestnuts were ground down and some remnant of the chestnuts were creating the texture of sand in my mouth. This dish came with white and shitake mushrooms under the duck, a puree of kabocha, and an al dente cylinder of daikon (under the duck and mushrooms). The slice-shaped object in the foreground was pan roasted duck fat. I want to say that the duck fat grossed me out, but I'd be totally lying. I ate that along with the rest of the dish. The flavors in this dish were really well composed, but the duck breast was way overcooked. The meat was actually tough and hard to chew, which took away from the enjoyment of the dish. Additionally the kabocha puree was a little too sweet and threw off the balance of the dish. However, the roasted duck fast saved the dish for me. It provided extra fat to compensate for the overcooked duck, and the great rich flavor of the duck fat was enough to drown out the over-sweet kabocha puree. By no means a perfect dish, but it was palatable. 5th course: Truffle Cheesecake with "truffle honey"
This cheesecake was a non-bake cheesecake. This dish would have been the best dish of the night except the veloute had more of the wow factor. The honey tied this dish together and was the perfect compliment to the cheesecake. The dish was not overly sweet and one could definitely taste the truffle in the dish. As a minor point of criticism the cheesecake used to prop the left wafer up was not the same cheesecake as the main dish. It was of a warmer temperature and didn't have the truffle infused flavor, so it brought an element of unbalance to the dish. Despite the criticism I've given, I did enjoy the meal at Cavaillon. The veloute dish is the first dish I've had in San Diego that has given me the "wow" factor that is expected from Michelin starred restaurants. I also enjoyed the foie gras torchon (which I mentioned in the previous post is hard for me to like) and technical execution of the risotto (with truffle shavings). However, since I came to Cavaillon for the truffle tasting menu, the star of the show needs to be the truffle. 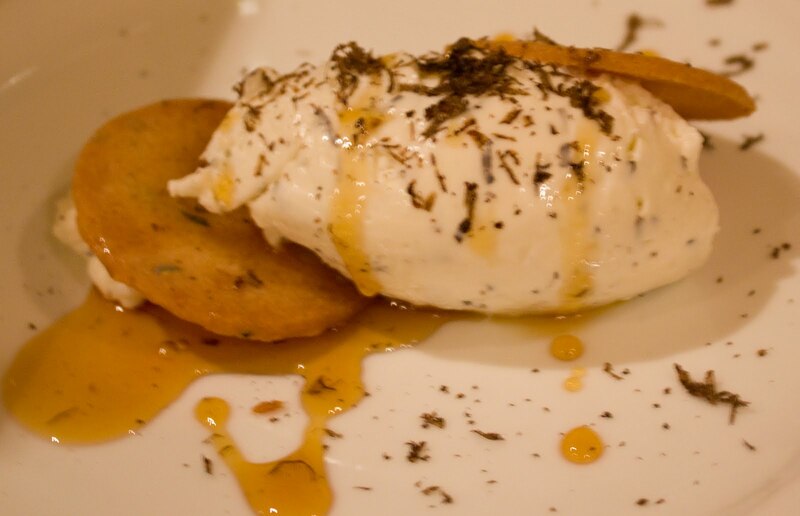 I got a lot of taste of truffle, but I didn't feel like it was the start in any of the dishes. The torchon was the star of the 1st dish, the risotto the 2nd dish, the veloute the 3rd dish, the fat the 4th dish, and the honey in the 5th dish. I want to award Cavaillon the megabyte award for the wow factor of the veloute, but I'm unable to do so at this time. I definitely plan to return to Cavaillon in the future and hopefully I will be able to give it the proper recognition at that time.